he Upanishad represent a significant reorientation in the philosophical thinking and approach of ancient Indians towards their understanding of God, the status of individual souls in God's creation and their relationship with Him, a development that opened a new chapter in the religious practices and traditions of the Indian subcontinent and epitomized the flowering of human consciousness on a scale that was unprecedented before in the history of human civilization in both the eastern and western hemispheres. The Upanishads teach us to discern the Reality that surrounds amidst the glamour and glitter of life and know truth from untruth so that we are neither ensnared by its attractions nor repulsed by its vulgarity. They unravel the secrets that are hidden deep with in our consciousness and introduce us to ourselves in a different light, equating us with the universal self, Brahman, urging us to overcome our desire to perpetuate our limited selves and transcend our ordinariness to discover the greater self that lies beyond our minds and senses. The word "upanishad" means sitting near. In ancient India the Upanishads were taught to few individuals, who were tested for their spiritual inclination and readiness for liberation over a long period of time and only in person. They progressed slowly on the path as they sat near their masters and digested the verses one by one, meditating upon them for months and years. 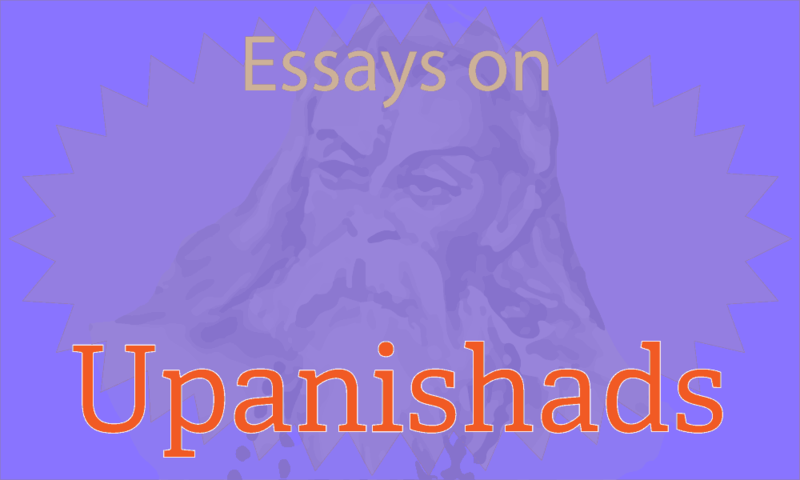 In the following essays we try to introduce you some of the concepts and ideas found in the Upanishads and how you can benefit from their study and understanding. This is an an attempt to present important concepts and wisdom of the Upanishads on a regular basis in a series of essays. This essay is about the history of Yoga based upon the references found in the Upanishads and how Yoga became integral to Vedic beliefs and practices. Was Isa Upanishad part of Ancient Self-immolation Rituals? An exposition of the Verse 2 of the Isa Upanishad on the importance of duty in life. Why the Upanishads are considred books of wisdom and how they contribute to your higher knowledge and liberation. About the Verses from the Kena Upanishad regarding the difficulty in knowing Brahman. An essay about About how the seers of the Upanishads entered higher states of consciousness in silence and unraveled the secrets knowledge of the Self. An essay about self-realization or self-knowledge, the process of knowing the Atman, and the individual Self, in Hinduism according to the Upanishads. The purpose of this translation is present the historical and spiritual value of the Upanishad to our readers. Presently youu will find here only an introduction and a few verses. Collectively, the Upanishads are known as Vedanta (end of the vedas). The name has struck, because they constitute the concluding part of the Vedas. The word 'upanishad' is derived from a combination of three words, namely upa+ni+sad. 'Upa' means near, 'ni' means down and 'sad' means to sit. Atman is the immortal aspect of the mortal existence, which is hidden in every object of creation including man. It is the microcosm, representing the macrocosm in each of us, imparting to us divine qualities and possibilities and providing us with the reason to exist and experience the pains and pleasures of earthly life. Find out what advise Brahma gave to his three offspring and why it is relevant for us. This story from the Briahdaranyaka Upanishad about gods and demons contains an important lesson to learn. Find out. Brahman is the central theme of almost all the Upanishads. Brahman is the indescribable, inexhaustible, omniscient, omnipresent, original, first, eternal and absolute principle who is without a beginning, without an end , who is hidden in all and who is the cause, source, material and effect of all creation known, unknown and yet to happen in the entire universe. The Upanishads are the supreme work of the Indian mind, and that it should be so, that the highest self-expression of its genius, its sublimest poetry, its greatest creation of the thought and word should be not a literary or poetical masterpiece of the ordinary kind, but a large flood of spiritual revelation of this direct and profound character, is a significant fact, evidence of a unique mentality and unusual turn of spirit. The collection of Upanisads translated by Dara shiko, Aurangzeb's brother, contained 50 Upanisads. The Muktika Upanisad gives a list of 108 Upanisads. With the exception of the first 13 Upanisads most of them are of more or less later date. The Upanisads dealt with in this chapter are the earlier ones. The Upanishads represent the loftiest heights of ancient Indo-Aryan thought and culture. They form the wisdom portion or Gnana-Kanda of the Vedas, as contrasted with the Karma-Kanda or sacrificial portion. The Upanishads abound in spiritual knowledge. In Sanskrit, the literary language of Vedic India, the word Upanishad means situated under Truth. The exact number of Upanishads is not clearly known. There must have been as many Upanishads in ancient India as there were schools and masters of self realization. There are several theories in Hinduism to explain this and no one knows for sure which one is correct. Besides it is all very confusing, as confusing perhaps as the theory of relativity by Einstein. According to one approach the whole universe is one self same reality. The exact number of the Upanishads is not clearly known. Scholars differ on the total number of Upanishads as well as on what constitutes an Upanishad. Some of the Upanishads are very ancient, but some are of recent origin. Any attempt to explain Brahman to the satisfaction of a mind that is driven by reason and familiar with the concretization thought is fraught with enormous difficulties, because that which is inexplicable cannot be explained by any amount of reasoning and logic. Strictly speaking everything in the universe is a manifestation of Brahman only. Innumerable are his forms and manifestation, but He is One and Alone, without a beginning and without an end. He pervades everything, is hidden in everything and enveloped by all that is here and elsewhere. Through simple stories the Upanishads explain great philosophical truths. This is one such story about the existence and knowledge of Self.